The Calligraphy Initiative in Honor of Lloyd J. Reynolds, a program of the Douglas F. Cooley Memorial Art Gallery, is introducing a new generation of Reed students and community members to the study and practice of calligraphy and paleography. The Calligraphy Initiative offers a series of weekly Scriptoria, free and open to all Reed College students, staff, faculty, and alumni. All materials provided, no prior experience necessary. Thursdays: 6:00–8:00 p.m., PSYCHOLOGY building room 102-103. Fridays: 2:00–4:00 p.m., PHYSICS building room 123. Throughout the Pacific Northwest, the legacy of Lloyd Reynolds and the calligraphy program he established at Reed College has been carried on by two generations of his former students. Along with the work of Reynolds' successor Robert Palladino, the calligraphy program at Reed has had an incalculable influence on the field of letter arts from poetry to digital typography. However, since the formal dissolution of the calligraphy program and its removal from the Reed curriculum in the 1980s, there is little living evidence of Reed's illustrious calligraphic heritage on the Reed campus. In an effort to reintroduce the calligraphic arts to the Reed community, a diverse gathering of interested community members bagan to meet in the fall of 2012 under the title of the Reed Scriptorium. In 1949, when Lloyd Reynolds began teaching formal calligraphy classes at Reed College, he founded the Graphic Arts Workshop with the intention that it serve as the laboratory component of the Reed Humanities program. As a lab, the Graphic Arts Workshop was a place to experience and practice the art of hand-lettering by experimenting with historical methods and materials. Through this practice, calligraphy instruction at Reed nurtured the development of intellectual, social, and sensory knowledge, exploring the iconography and symbolism of the alphabet, while studying script and typeface development throughout history. In contrast to the history of formal calligraphy instruction at Reed, the Reed Scriptorium is not a for-credit class. Instead, we welcome guest instructors—including Robert Palladino and Inga Dubay—to rigorously impart calligraphy's formal pedagogy to Scriptorium participants. As generations of Reynolds' and Palladino's students have demonstrated, the practice of calligraphy ignites unique, embodied forms of knowing, uniting intellectual activity, bodily knowledge, and the senses, providing an integrated and disciplined means for understanding the self in relation to the origins of culture. The Calligraphy Initiative was founded in 2012 by Cooley Gallery Director Stephanie Snyder '91, as an outgrowth of the Cooley Gallery exhibition, Lloyd Reynolds, A Life of Forms in Art (2011), curated by Gay Walker '69 (Special Collections Librarian, Reed College) and Stephanie Snyder, and enriched and elucidated by the educational outreach activities of Gregory MacNaughton '89, Cooley Gallery Education Outreach Coordinator. The Calligraphy Initiative is organized by Gregory MacNaughton '89, Education Outreach and Calligraphy Initiative Coordinator of the Cooley Gallery. Please visit Reed's Calligraphy Heritage website to learn more about the history of calligraphy at Reed College, and to view a wide variety of critical resources for the study and practice of calligraphy. Please visit the Lloyd J. Reynolds Collection of Reed's Eric V. Hauser Memorial Library for a complete list of holdings. 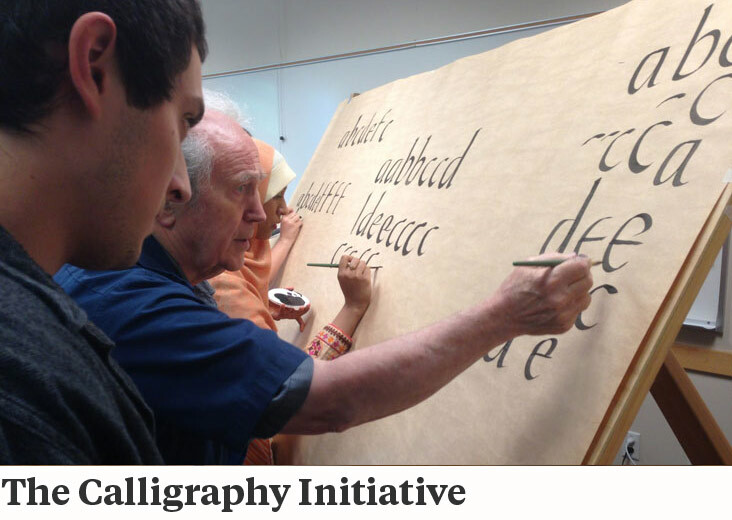 The Calligraphy Initiative, including the establishment of the position of Calligraphy Outreach Coordinator, was made possible by a generous gift from a Reed College alumnus, and was stewarded into existence with the support of the Office of the President, the Office of the Dean of Faculty, and the Office of College Relations. In addition, the following individuals offered invaluable support and wisdom to help guide the study and practice of calligraphy back to Reed College: Inga Dubay, Barbara Getty, John Sheehy '82, Sumner Stone '67, Gary Snyder '51, Georgianna Greenwood '60, Gay Walker '69, Lee Littlewood '68, Robert Palladino, Phyllis Reynolds, Judith Reynolds, Allison Tepper '11, Vice President for College Relations Hugh Porter, Emeritus Dean of Faculty Ellen Stauder, Dean of Faculty Pat McDougal, and Emeritus President Colin Diver.